http://www.meaningfulhq.com/uncovering-happiness-mindfulness-depression.html // EP042: Elisha Goldstein - Uncovering Happiness: Overcome Depression with Mindfulness and Self-Compassion. // In today's episode of The Meaningful Show Podcast, I'm joined by Dr. Elisha Goldstein to discuss how to overcome depression with mindfulness and self-compassion. Tune in and swing on over to http://www.meaningfulhq.com/uncovering-happiness-mindfulness-depression.html for the show notes! BOOK DESCRIPTION: In seven simple steps, Uncovering Happiness uses cutting-edge mindfulness and self-compassion techniques along with innovations in neuroscience to release natural antidepressants in the brain. Dr. Goldstein shows you how to take back control of your mind, your mood, and your life. Most of us believe when we’re depressed that our situation is hopeless. That’s a mistake, Dr. Elisha Goldstein reassures us in Uncovering Happiness. The secret to overcoming depression and uncovering happiness is in harnessing our brain’s own natural antidepressant power and ultimately creating a more resilient antidepressant brain.Uncovering Happiness is grounded in two key foundations: mindfulness and self-compassion, and backed by recent scientific discoveries. New research shows that mindfulness reduces the risk of relapse in people who have experienced depression and can be a significant alternative, or supplement, to medication. The second foundation is self-compassion—a state of mind in which you understand your own suffering with an inclination to support yourself. Goldstein explores our natural antidepressants—along with mindfulness and self-compassion, also purpose, play, and confidence—and offers specific techniques for putting them into action. Together, these elements can transform something that typically forces us to spiral downward and turn it into an upward spiral of self-worth and resiliency. At its core, Uncovering Happiness contains a persuasive argument for hope: Having had depression in the past doesn’t mean you must also suffer from it in the future. You can build up the sections of the brain that protect you from depression, and slow down the sections that foster it. Doing this allows the brain’s own natural antidepressants to emerge, grow stronger, and contribute powerfully to the resiliency that we need to enjoy the good times, survive difficult times, and open ourselves up to lives that truly feel worth living. No time to read? Get thousands of non-fiction book summaries with FlashBooks. We condense the actionable insights from the best Business + Self-Help books into 20-minute summaries that you can read (or listen to) anywhere. Subscribe for just $1. Cancel anytime. 042: Elisha Goldstein - Uncovering Happiness: Overcome Depression with Mindfulness and Self-Compassion: How to overcome depression with mindfulness and self-compassion. 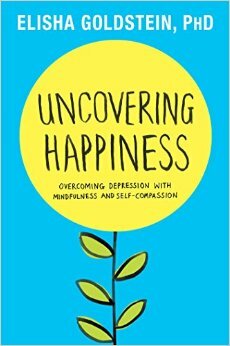 Interview with Dr. Elisha Goldstein, author of Uncovering Happiness.